The Switch comes with 32GB of in-built memory, but once you start buying yourself games or some chunky DLC from the eShop, you’ll quickly start to see that space dwindling. Don’t worry, though, you won’t have to delete your 105 hour Stardew Valley save, uninstall Mario Kart 8 Deluxe or even think about touching Legend of Zelda: Breath of the Wild to make some extra gaming room. But you will need to make room for the best Nintendo Switch games out there. There’s a way to expand that storage quickly and easily, and for relatively little cost too. Hidden away in the Switch is a micro SD card slot, which allows you to chuck in a memory card on which to store additional games and content. 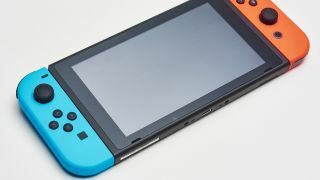 But the problem is that it is hidden away, and unless you know specifically where to look, you might miss the fact the Switch SD Card slot is there entirely. And don’t forget to check out our picks of the best micro SD cards for Nintendo Switch. Once you’ve bought yourself a micro SD card, take your Switch and flip it on its back, putting it screen-side down. Flip up the console’s kickstand and there, underneath, you’ll see the SD card slot lurking right at the bottom. Keep the logo of your SD card facing you, and then insert it until you hear and feel it click into place. The Switch will then display the fact it can read the micro SD card with a little icon on the menu bar of the home screen. You can then go into the settings and see all your new storage there in all its glory, and pick whether you want your games to install on the console first and overflow into the SD card, or the other way around. If you ever want to remove your micro SD card - whether to upgrade to a bigger one or simply to put all your screenshots onto your computer - just remember to turn the console completely off by holding down the power button for five seconds before you remove the SD card. What size micro SD card do you need? If you buy an official Nintendo Switch micro SD card, which comes adorned with Mario or Zelda on the packaging - not the actual SD card, which just has a tiny Switch icon on it, which you’ll never see again - you’ll find yourself spending at least double the price just for a bit of branding. In terms of compatibility, you just need to make sure that they are UHS-1 compatible, because you don’t need the kind of micro SD card that can record 4K or anything like that. But it’s worth keeping an eye on the speed. On every micro SD card there’s a number in a circle, which will indicate its read/write speed. The higher the number, the quicker it’ll be to load your game, so make sure you get a micro SD card with a big number 10 on it to ensure you’re getting the best speeds. What do you do if you run out of space? For option 1, you can simply transfer all of your game data from one microSD card to another using your computer. Or you can simply use several microSD cards at the same time, switching them in and out depending on the games you want to play and where they’re stored. Option 2, of course, is the cheaper version. Pick games that you’ve finished or probably won’t play for a while and uninstall them. You can always redownload them from your library as and when you fancy picking them up again. And don’t worry, all your game saves are kept on your console itself, so you’re not at risk of losing all that playtime and progress whatever option you choose.